3D films have a history of several decades, but only recently 3D video consumer products are gradually becoming popular. The focus of next-negation 3D research is on the so-called virtual-viewpoint (or free-viewpoint) video system. It is also an on-going standardization item in the international ITU/MPEG Standards. In addition to the movie special effects, one application of virtual-view system is the multi-view auto-stereoscopic (glasses free 3D) display. Typically, a densely arranged camera array is used to acquire input images and a number of virtual view pictures are synthesized at the receiver using the depth-image based rendering (DIBR) technique. Three essential components are needed for building a virtual-view system: depth estimation, data compression, and view synthesis. An interesting application of virtual-view system is 3D scene composition. It is an extension of the traditional chroma key technique but it now tries to merge two sets of 3D vide scenes into one consistent 3D scene. Another issue is depth map acquisition. Recent devices such as Microsoft Kinect offers an inexpensive hardware solution to this problem. However, its depth map quality needs to be improved. We will give a quick overview of these challenging topics and summarize our studies on these subjects. Hsueh-Ming Hang received the B.S. and M.S. degrees from National Chiao Tung University, Hsinchu, Taiwan, in 1978 and 1980, respectively, and Ph.D. in Electrical Engineering from Rensselaer Polytechnic Institute, Troy, NY, in 1984. From 1984 to 1991, he was with AT&T Bell Laboratories, Holmdel, NJ, and then he joined the Electronics Engineering Department of National Chiao Tung University (NCTU), Hsinchu, Taiwan, in December 1991. 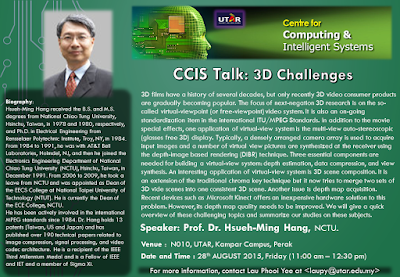 From 2006 to 2009, he took a leave from NCTU and was appointed as Dean of the EECS College at National Taipei University of Technology (NTUT). He is currently the Dean of the ECE College, NCTU. He has been actively involved in the international MPEG standards since 1984. Dr. Hang holds 13 patents (Taiwan, US and Japan) and has published over 190 technical papers related to image compression, signal processing, and video codec architecture. 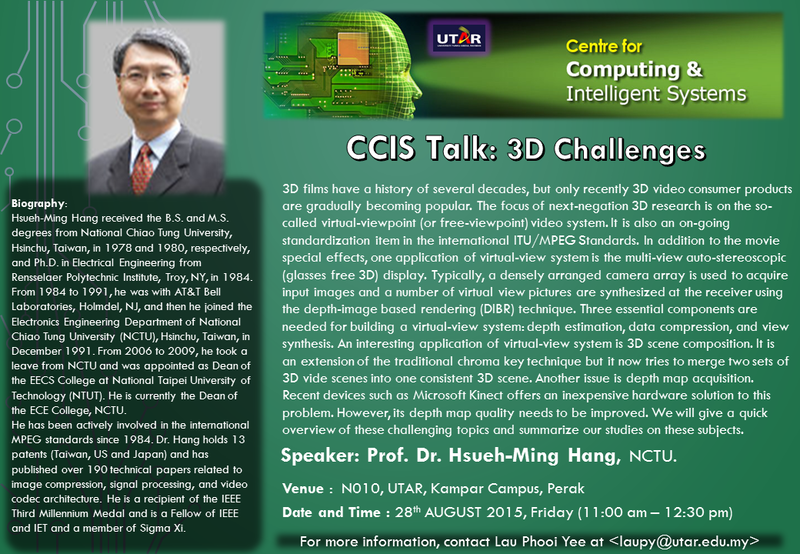 He is a recipient of the IEEE Third Millennium Medal and is a Fellow of IEEE and IET and a member of Sigma Xi.